Wood is dirty this time of year. Dirty and necessary. It starts with a load dropped in your driveway. It’s frosted in snow and ice, the frosting protects a layer of dirt and soil since you are now getting the stuff that was downed and split in the fall or perhaps early summer then covered with leaves and the detritus of many loads of wood dropped on top of it since. 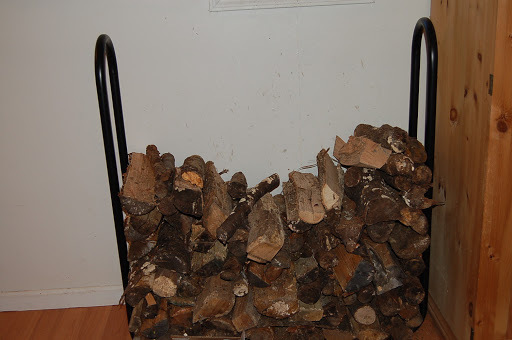 You stack it in the garage hoping the layers you knocked off while stacking along with the air-flow method you employed mean dry wood when you actually need it. 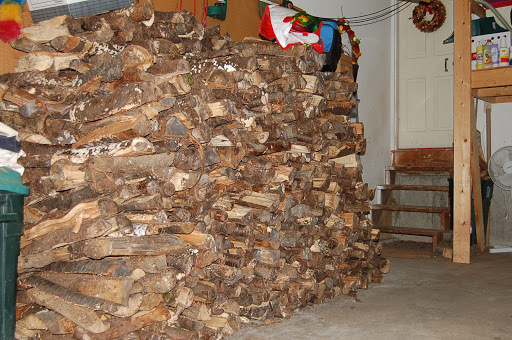 But the temperature of the wood itself keeps the garage cold and the logs are lightly fused together from the moisture left during stacking. You carry armloads from the garage to the “tack room/mud room” which is relatively warmer. Silt sifts down through the pile as it warms, settling on the lower pieces and blanketing the floor. It sits for a day or so there as you deplete the log holder piece-by-piece. From there it moves to the living room and the warmth of the basket next to the fireplace. Here it will have a short life of intense drying which releases further particles of dirt and debris. Finally, it goes into the fire where amazingly, you see spiders and bugs come alive and scurry to escape the flames. The wood then is reduced to ashes which require frequent trips to the backyard in the ash-bucket so the fireplace will draw properly. This entry was posted in heating. Tagged fireplace, heating, Wood. Next Post Next post: Comfort Food Monday – Chocolate Cake in a Mug – Who Knew?? 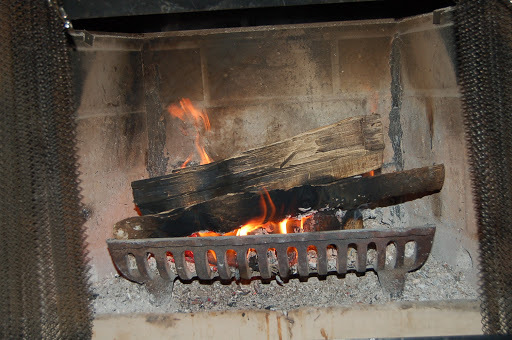 I used to love our woodstove. I enjoyed cutting, splitting and stacking wood. I have fond memories of sitting in a warm room while the woodstove purred and a pot steamed on top of it, putting moister into the air. After a while, though, hauling all that wood up the stairs got old. Now I just flip a switch and the gas fireplace lights up. It's not as satisfying but it's a lot cleaner and simpler.